Food scientists are developing food for astronauts that stays nutritious and fresh for at least three years. NASA astronaut Michael Hopkins' Thanksgiving meal on November 28, 2013. Image from aboard the International Space Station. 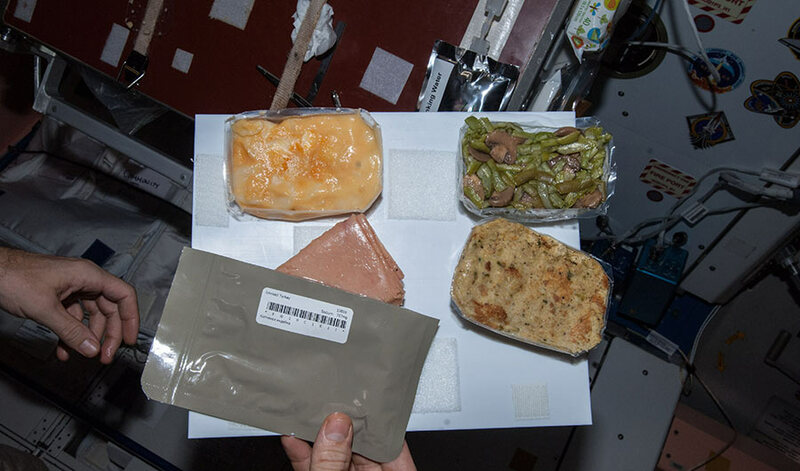 (Inside Science) -- It may be decades before humans land on Mars, but when they do, the meal options may look something like this: salad with ancient grains, vegetable protein, reconstituted cheese product and a side of dried fruit, with a chocolate-hazelnut vitamin shake packaged three years ago for dessert. Don't worry, the salad was grown on board and the vitamins are still potent. Astronauts may be able to grow some fresh food, but they'll still need vitamins from home. Nutritional supplements can last at least three years --and even taste good -- as long as they're packaged in the right snacks, according to new research led by the U.S. Army. The study, led by food engineer Ann Barrett at U.S. Army Natick Soldier Research, Development and Engineering Center in Massachusetts, is among the first to demonstrate what happens to a packaged food's nutritional content over a long storage period. "Vitamins are chemicals, and they degrade. Even if you can have foods that are safe to eat, microbiologically, they might not have the same nutritional value after a long period of time," Barrett said. If astronauts' food supplies gradually become less nutritious, their health could suffer, and their ability to work safely or return home could be compromised. Working under a NASA grant, Barrett set out to study what would happen to common dietary vitamins A, thiamine, folic acid, C, and E after three years of storage at different temperatures. Those compounds are crucial for numerous functions, including vision, immunity, muscle function, and antioxidant capabilities. They are also all highly susceptible to breakdown in the air and in high heat. Barrett's team worked with a private company to coat the vitamins in water-loving or oil-loving materials, which preserved and stored them in a form that could be used in food. They used an Army recipe to make a chocolate drink powder, as well as low- and high-fat versions of granola bars containing blueberries, rice and oats. They added the coated-vitamin mixture to the dough, mixed everything in a food processor, compressed the dough into dense bars, and packaged the bars in vacuum-sealed wrappers. After a year, the team ran some tests to see if the bars' vitamin content held up, and tasted them. They repeated this each year for two more years. Using a 9-point scale, taste testers gave each bar at least 6 points even after three years of storage at 69.8 degrees Fahrenheit. Of the three options, the lower-fat energy bar broke down fastest, and saw the quickest decline in tastiness, according to Barrett. "That was because we didn't have enough fat in it to make it cohere well, so it had lower scores because of the texture," she said. The high-fat bar was the best at preserving most vitamins. Of all the vitamins, folic acid degraded the most in all the tests. It declined by 21 percent in the high-fat bar and almost 30 percent in the low-fat drink mix. Thiamine fared best, with a drop of just 4.5 percent in the low-fat bar. But despite the drop in vitamin content, all the vitamin levels stayed well above NASA's minimum requirements, Barrett said. The U.S. Army is America's original purveyor of long-lasting, ready-to-eat, portable food. During the Revolutionary War, the Massachusetts legislature set a daily ration for bread; beef or pork; rice; beans or peas; and "one quart good spruce or malt beer," according to the Smithsonian National Museum of American History. Through the centuries, the Army ration, "meal, ready to eat," or MRE, has evolved considerably. Today an MRE packs 1,200 calories into a lightweight package that can withstand a 100-foot airdrop and has a minimum shelf life of three and a half years at 81 F.
Round trips to Mars could average at least two and a half years, including a six-month journey to Mars, and any stay would have to last long enough for the planets to realign and make the trip home as efficient as possible. NASA's call for new products said that they wanted foods that could be cached up to five years, Barrett said. Astronauts won't have to rely solely on food brought from Earth, however. Years of research have shown that greens and some grains can grow even in the austere conditions of a spacecraft, said Kent Kobayashi, a plant scientist at the University of Hawaii at Manoa. Just as farmers do on Earth, astronauts would stagger their sowing and harvesting to produce fast-growing greens like lettuce alongside slower-growing crops like potatoes. "It is important to consider how much of the plant material is eaten per amount of water that is used to grow the plant. Lettuce and other leafy crops have the advantage of most of the plant can be eaten," he said in an email to Inside Science. Potatoes, on the other hand, he wrote, require water and fertilizers, and produce stems, leaves and other biomass that isn't eaten, which makes growing them less efficient. The most important factor would be choosing crops that can provide a wide range of vitamins and nutrients necessary for survival, Kobayashi said. Other researchers are studying decidedly more unique ways to provide nutrition in space. In 2017, researchers at Pennsylvania State University in University Park described using anaerobic bacteria to break down human waste, and produce a nutrient-dense, fatty paste -- similar to Vegemite or peanut butter -- that could serve as a nutritional supplement. Compared to options like that, a slightly stale, crumbly breakfast bar sounds quite delicious. Either way, unlike soldiers in the Army, who can eat in mess halls or off-site, astronauts don't have much food choice, Barrett said. "For soldiers, if they don't eat well enough, or they select only the junk food, it's not going to kill them," she said. "That's not to say the Army is not interested in their nutrition, but it's especially critical for astronauts."